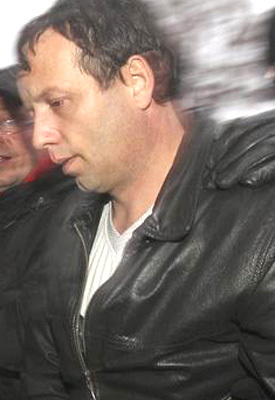 The hacker "Guccifer"--whose e-mail raids victimized scores of celebrities, politicians, and other public figures--pleaded guilty yesterday to criminal charges filed in his home country of Romania. During a court appearance Monday in Bucharest, Marcel Lazar Lehel, 42, admitted illegally accessing the e-mail accounts of several victims, including George- Christian Maior, head of the Romanian Intelligence Service, and Corina Cretu, a Romanian politician and member of the European Parliament. A judicial tribunal will eventually sentence Lehel for the e-mail hacks. Cretu’s hacked account yielded a series of e-mails and photos she exchanged with former U.S. Secretary of State Colin Powell. The theft of the “very personal” correspondence prompted Powell--who himself had been hacked by “Guccifer”--to issue a statement denying that he had engaged in an affair with the foreign diplomat. In copping to the Romanian hacks, Lehel (seen above) said that he regretted the illegal incursions, but added that they had not caused damage to the country’s national security. Lehel was arrested in late-January during a raid at his home by agents with Romania's Directorate for Investigating Organized Crime and Terrorism. He has been imprisoned since his bust. In 2012, Lehel was convicted of hacking the e-mail accounts of several Romanian public figures. The former cab driver received a three-year suspended sentence for those online assaults. In light of this prior conviction, Lehel is unlikely to escape prison for the Cretu and Maior hacks. As reported in these pages, “Guccifer” victimized scores of other public figures in the U.S. and Europe. The hacker broke into the e-mail accounts of members of the Bush and Rockefeller families; Obama administration officials; journalists and authors; business executives; three members of England’s House of Lords; military officers; Council on Foreign Relations members; and actors like Mariel Hemingway and Rupert Everett. In e-mails to TSG, “Guccifer” wrote that his hacking spree was prompted, in part, by his desire to embarrass members of the Illuminati and other shadowy groups that purportedly controlled the world. “the evil is leading this fucked up world!!!!!! i tell you this the world of tomorrow will be a world free of illuminati or will be no more,” the hacker declared in one e-mail. It is unclear what effect Lehel’s guilty plea in Romania will have on criminal investigations in the U.S., where FBI and Secret Service agents began probing the “Guccifer” hacks in February 2013.